Are you in the market for Sand Orlando? Orlando Outdoors has one of the largest selections of sand, mulch, sod, and plants. Sand Orlando by Orlando Outdoors has been in business sense 1995. With sand Orlando, gravel and rock reserves located throughout Orlando, Orlando Outdoors offers a full range of sand and rock products including base course material, fill products, washed aggregates of all sizes, sand of all types, golf course sand, landscape boulders, and specialty landscape products. Custom crushing and processing capabilities are also available per customer specifications. Orlando Sand is a naturally produced material by Mother Nature and has many useful purposes for the landscaping and building industry. 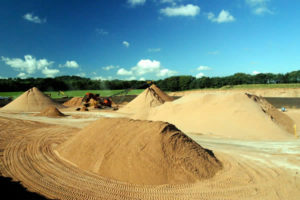 The most common locations where sand is dredged from are; river banks and seashore sand bankments such as beaches. There are various types of sand and sand colors. Nursery sand is used by Nursery Centers for planting and re potting specific plants, trees and shrubs that require some amount of sand mixture. Nursery sand is mixed with fertilizers and peat moss for specific plantation types.